Credit: Chandra: NASA/CXC/SAO/P.Slane et al. ; XMM-Newton: ESA/RIKEN/J.Hiraga et al. 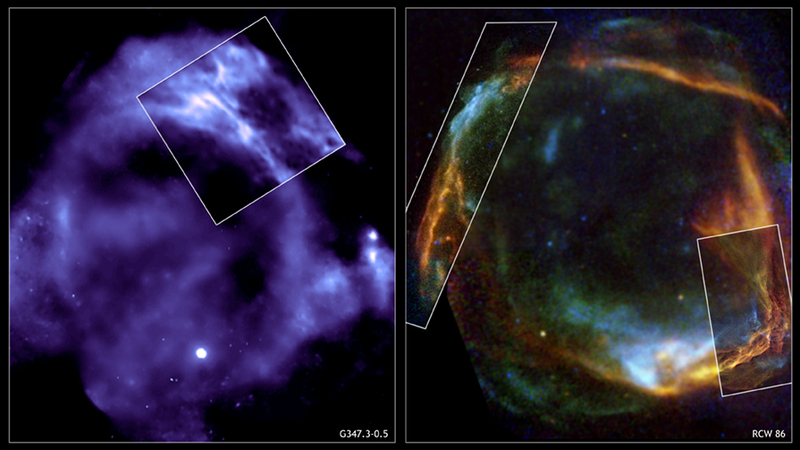 These images of two supernova remnants, G347.3-0.5 and RCW 86, show the result of combining data from NASA's Chandra X-ray Observatory and ESA's XMM-Newton. In each image, XMM-Newton has obtained data from a much wider field-of-view, while Chandra has been used to concentrate on key areas of interest to researchers (outlined in the boxes). RCW 86 (right panel) may be the one of the earliest stellar explosions ever recorded. The formation of the remnant appears to coincide with a supernova observed by Chinese astronomers (and perhaps the Romans) in 185 AD. Together, the Chandra and XMM-Newton data show the expanding ring of debris that was created after a massive star in the Milky Way collapsed onto itself and exploded. Both the Chandra and XMM-Newton images show low-energy X-rays in red, medium energies in green and high energies in blue. 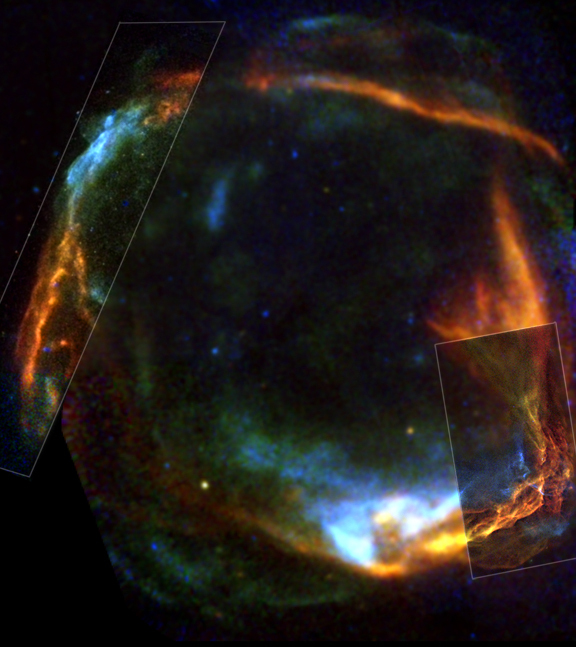 The Chandra observations focused on the northeast (left-hand) and southwest (lower right) side of RCW 86, and show that X-ray radiation is produced both by high-energy electrons accelerated in a magnetic field (blue) as well as heat from the blast itself (red). As in the case of RCW 86, it is believed that the Chinese may have witnessed the supernova that caused G347.3-0.5, but a couple of centuries later in 393 A.D. According to the Chinese records, a bright star in the location of G347.3-0.5 was visible for months and rivaled the brilliance of Jupiter. X-rays from G347.3-0.5 are dominated by radiation from extremely high-energy electrons in a magnetized shell rather than radiation from a hot gas. The remnant is also a source of very high-energy gamma rays. The bright point-like source on the lower section of the image (which only shows the upper portion of the entire remnant) is similar to other known neutron stars and indicates that G347.3-0.5 is the result of a core-collapse of a massive star. In both the Chandra and XMM-Newton images, the intensity of X-rays is represented by the brightness of the color. Credit Chandra: NASA/CXC/SAO/P.Slane et al. ; XMM-Newton: ESA/RIKEN/J.Hiraga et al. Coordinates (J2000) RA 17h 11m 48.00s | Dec -39º 34' 00.00"
Credit Chandra: NASA/CXC/Univ. of Utrecht/J.Vink et al. ; XMM-Newton: ESA/Univ. of Utrecht/J.Vink et al. Coordinates (J2000) RA 14h 45m 02.30s | Dec -62° 20´ 32.00"